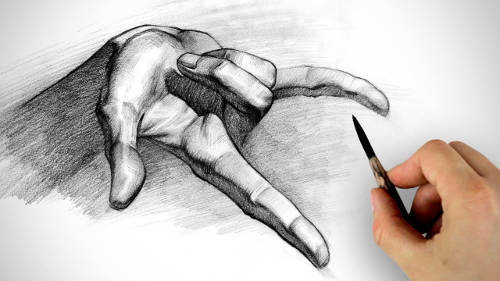 Shading is an essential part of drawing (and the most overlooked by beginners) if you are looking to add some realism or give the three-dimensional illusion to your artwork. In this section, you will get to know how to do shading as well as factors that contributes to effects such as lights and shadows.You will also learn the different techniques of shading, for example; blending effect and using erasers to fix up your shading. Lights and shadows are used to visually define a form.Without them, your artwork would be rather plain and boring.Applying the interaction of lights and shadows on your artwork will enable to create mood, expression, personality of a person as well as timeline for the environment (afternoon, evening). In this section, we will explain on how lights and shadow work and how it can add more “realism” in your artwork. Lights/Lighting – Lighting on a form is the result of a light source. Everything in the area of the light source is effected .The light source can be anything from the outdoor sun/moon, street lights, to indoor lighting, table lamps.Regardless of the light source type, there are a couple of lighting basics that you need to know. Highlights – Highlights are areas or surfaces that get the most light from a light source making it the “brightest bright” of a form or an object.The intensity of the highlight depends on the texture of the shape for example, metallic or glass like object will reflect a more sharper intense highlight when compared to a wooden surface. Reflective Light – At the darker side of a highlighted object or form, you will notice a patch of light is formed. This type of light is called reflective light, or fill light. It is the result of lights being bounced to the darker side usually from a flat surface nearby the object/form. Most would be tricked into thinking that the patch of light is from a different source of lighting from different angle. Lighting can also be used to show emotion, expression and can even be used to influence the environment. Be careful if you are planning to use these type of lighting in your artwork and make sure that you have the lighting effect and shadow properly in place to avoid making the object, figure or the environment look “awkward” or “realistic” to fit together. Rembrandt Lighting – also called three-quarter lighting, this method of lighting is the most commonly used in comic art and many art school. Rembrandt lighting is done by placing the light source at a three-quarter setting (upper left or right, lower left or right). Unlike the frontal lighting,this method actually provides more detail on the object or figure. If used for a human figure, the lighting will effect most part of the body and can help define more detail and muscle tones. Top Lighting – Top lighting is when the light source is directly above the object or figure. Part like the forehead, nose, shoulders, and the chest area receives the most light. -Qualities or expression from top lighting : Holy, Peaceful, Angelic, Purity. Frontal Lighting – Frontal light can be achieve by placing the light source in front of the object or figure. Frontal lighting is great for portraying a surprising, explosive or blast like element. Implementing this method can be quite tricky as this lighting method actually flattens out most shape and details. Back Lighting – Back lighting is lighting an object or a figure from behind.With the light concentrated at the back, most of the front part of the object/figure is covered in shadow. As from the viewer point of view, not much detail can be seen if this type of lighting is in use.Despite that, this setting is best if you are planning to get a more dramatic mood going on for your artwork. Form Shadow – Commonly referred to as core shadow, form shadow happens when a light source hits an object or figure and forms a shadow that varies from soft to wide areas of the lighter side of the object. Cast Shadows – Results from one object or figure casting a shadow on another. The two object/figure are on different areas and if the object that casting the shadow is larger, then the shadow will usually become darker (unless there is a different light source). It is advisable that you focus more on the edges of the cast shadow. If the cast shadow fall farther from the object/figure, the edges will become softer. There isn’t one “ultimate” method of shading and once you know how light and shadows works, you should have little problem with shading properly. It is best that you experiment with different shading properties and at the same time it can improve the overall look of your artwork. Here are some hatching techniques that can improve your use of shading. Hatching – Hatching is used to add value or effects to your shading by adding a series of close spaced parallel line, making it a great starting point for detail in your shading. Lighting hatching are used on parts that is facing the light source and darker hatching for has little or no lighting. The hatching technique is known to give result almost instantly. Crosshatching – Crosshatching is one of the commonly used techniques method in when drawing a figure in comics. With crosshatching, you will be able to make smooth gradation from light to dark making it useful when used for Rembrandt lighting or for cast and form shadows. The difference from hatching is that for crosshatching, you draw the line strokes overlapping. Squiggles – When it comes to shading, lines aren’t everything. Squiggles can be used for shading as well. Squiggle is great for creating texture as well as value. One thing to keep in mind when when drawing squiggles is to be consistent and relaxed because strong or hard pressure will make the squiggles look solid and fixed. Blending – Blending can make quite a mess and can sometimes be unpredictable, but it is a technique that is pretty simple to apply and easy to get used to.The saying “practice makes perfect” fit the blending technique really well because only through regular use of the technique can you really be able to get the result you want. Shading primarily involves the lighting and techniques used to create the effect desired. Without it, you risk your artwork looking flat and less appealing. The relation between these two are so important that one cannot be done without the inclusion of the other. When there is a light source, there will always be a dark side or shaded area and you cannot work out the value of the shaded area without the highlight which involves the the direction of the light source. Get the idea? Never fast forward through this process. Shading is important in making anything that you draw to be realistic and believable. The more time you spent studying this, you will then be more confident and have a better understanding of how shading works.